WASHINGTON: Warner Brothers is taking action against US President Donald Trump for using Hans Zimmer's score from the movie 'The Dark Knight Rises' (2012) on his Twitter account for a campaign. Warner Brothers is the studio that produced the trilogy. 'Why Do We Fall' plays in the background. The two-minute tweet posted on last Tuesday has a layer of text over 'Why Do We Fall,' but no dialogues, on the microblogging platform under Trump's account. The video features Trump meeting North Korea's Kim Jong-un and Brazil's Jair Bolsonaro. Former US President Barack Obama and others are also seen. The video reads: "First they ignore you, Then they laugh at you, then they call you racist" ... Your vote proved them all wrong." And the photos of Obama, Hillary flash across. Warner Brothers studio told HuffPost, "The use of Warner Bros' score from The Dark Knight Rises in the campaign video was unauthorized. We are working through the appropriate legal channels to have it removed." Zimmer was an associate of Christopher Nolan. He composed songs for the latter's three Batman films and had won a Grammy in 2009. The soundtrack has since been pulled out for copyright violations. 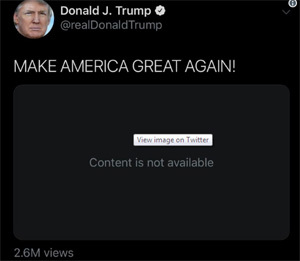 It was a fan-made 2020 Trump re-election campaign video retweeted under his account. Earlier, musicians Pharell Williams and Aerosmith had also made such complaints.